Asus today launched Asus Fonepad 7 tablet and Asus Transformer Book T100, a 10.1 Inch Ultra portable Windows 8.1 Hybrid in India priced at Rs. 17, 499 and Rs. 34, 099 respectively. This New version of Fonepad was showcased at IFA 2013 couple of months back and comes with Calling facility. The Asus Fonepad 7 is powered by Intel Atom Z2560 Dual core processor clocked at 1.6 GHz as compared to the last generation’s 1.2GHz Intel Lexington processor. The RAM capacity is 1 GB and the 16 GB internal storage variant has been launched in India. 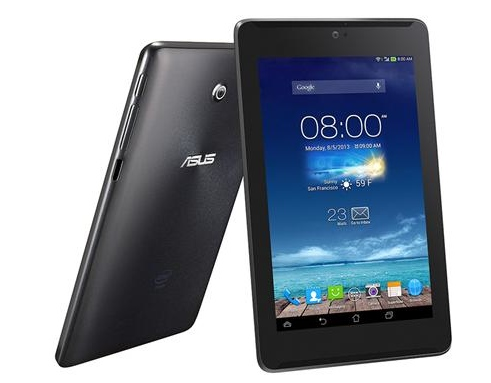 ASUS FonePad 7 comes with a IPS LCD backlit 7 inch 1280 x 800 (WXGA) HD display. This amounts to a pixel density of 215 ppi which is pretty good for a 7 inch Tablet. The Android version is Android 4.2 Jelly bean with ASUS custom UI on top. The Floating App which comes preloaded on this device helps in Multitasking by letting you open up to 6 Apps at once. The Tablet has a 5 inch camera at the back which is capable of full HD video recording and capturing up to 100 shots in burst mode. A secondary camera of 1.2 MP is also present for video calling. The battery capacity is admirable at 3950 mAh and will give you 28 hours of calling and 10 hours of tablet use. Connectivity features include Wi-Fi, Bluetooth v3.0, micro-USB, micro-SIM, A-GPS and 3G. The Asus Transformer Book T100 is powered by Intel Bay Trail processor, Z3740, with integrated Intel graphics. The display is 10.1 inches in Size and the IPS LCD display features 1366 x 768 pixels. The tablet runs on Windows 8.1 O.S. The tablet weighs 550 grams without the keyboard, which is significantly less for a 10 inch tablet and with the keyboard it will weigh around 1 Kg. Connectivity features include micro-USB port, micro-HDMI port, MicroSD card slot and 32 GB of internal storage. The Keyboard will feature one USB 3.0 port and a touch pad as well. The battery capacity will last 11 hours. Both of these devices will be available from November 2013 in India.